Imagine you could obtain a 4K monitor — that does 120Hz — and it has a fully adjustable optional strobe backlight (open source firmware!) with a switchable scanning backlight mode? Many of us would be absolutely excited to have such a high refresh rate for 4K alone. 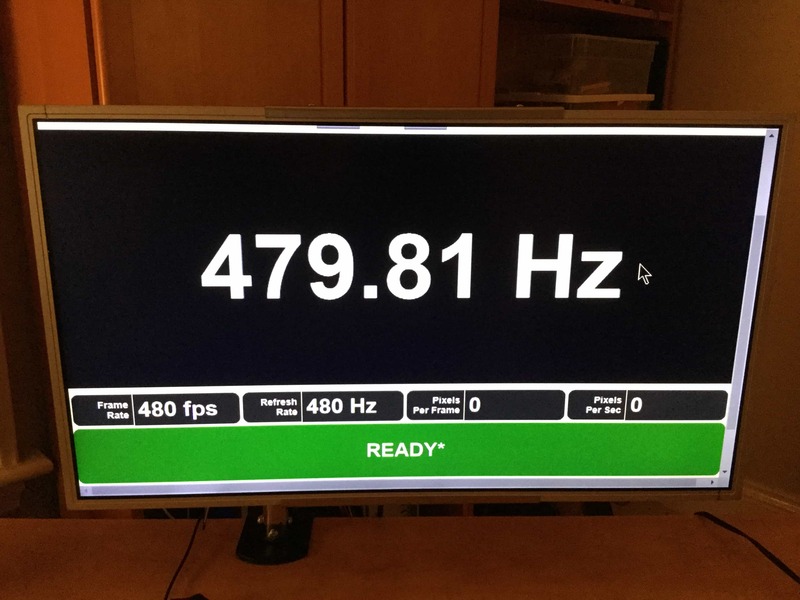 We obtained an engineering unit (samples available for preorder, link below) of the Zisworks 4K 120Hz display that utilizes a custom FPGA board to achieve the Hertz goodness. This single feature, 4K 120 Hz alone, truly justifies this display even if “480 Hz does not matter”. As long as your recent graphics card has two DisplayPort jacks, it can do 4K 120Hz. Only one cable is needed for all other modes, including 480 Hz. 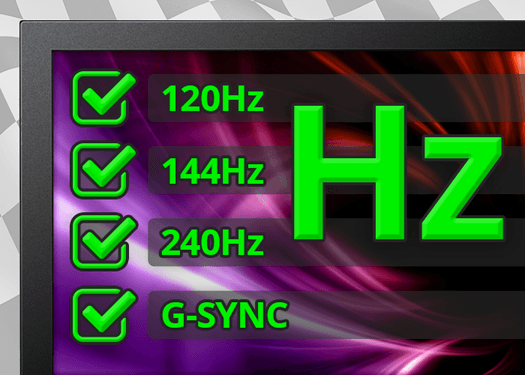 But it also has bonus high-Hertz modes: 1920×1080 at 240Hz, 1280×720 at 300Hz, and 960×540 at 480Hz! 4K 120Hz is amazing. But today, we’re testing 480 Hz for Part 1. 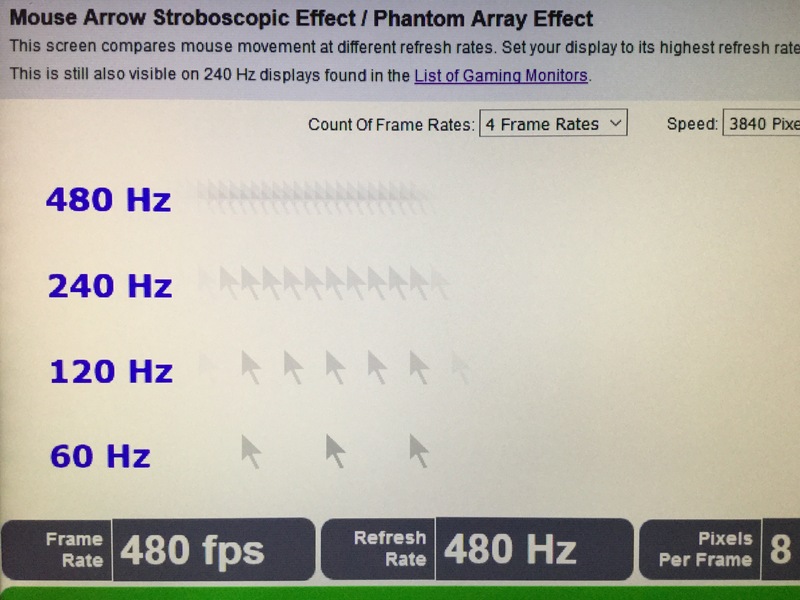 The jaw dropping refresh rate in the stratosphere, begs the question, “Can the human eye see that many Hz?“. The ability to achieve 2ms persistence, “ULMB without strobing“, or a “Flickerless CRT” is a sample-and-hold holy grail. In order to achieve the equivalent of ZeroFlicker CRT clarity, it is absolutely necessary to achieve ultra-high refresh rates as a law-of-physics issue for motion blur. But this is LCD tech! With a GtG pixel response limitation! Surely, people ask, can 480 Hz further improve LCD technology? Surprisingly, our TestUFO tests shows the answer is YES — with some caveats. Read on. Initially, none of the web browsers could run the www.testufo.com Motion Tests at 480 frames per second with perfect refresh rate sync at default settings. IE and Edge fails at above 105Hz (with Microsoft refusing to fix this bug), rendering these browsers useless for high-Hz scientific and vision research. However, we discovered that FireFox ran 480 Hz perfectly after adjusting a Windows setting (Minimum CPU = 100%). Finally, we created brand new TestUFO motion tests that helped push refresh rate testing to the limits, just specifically for this article. We are the world’s first enthusiast website to test 480 Hz, so we have developed new tests for 480 Hz. Going to higher refresh rates can have diminishing points of returns. Humans cannot see individual frames at 480 Hz. 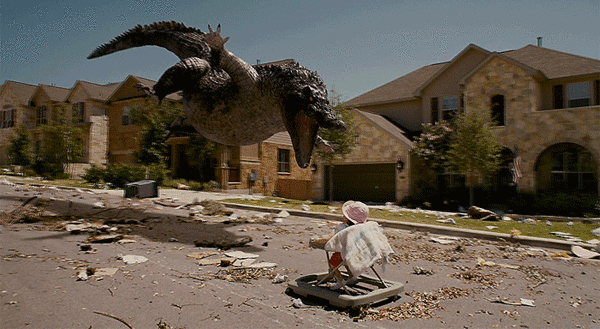 However, humans can see other side effects of non-analog motion (discrete frames to represent moving objects). Many researchers including Oculus’ chief scientist Michael Abrash, extoll the benefits of quadruple-digit refresh rates. So even 480 Hz is not the final frontier yet. 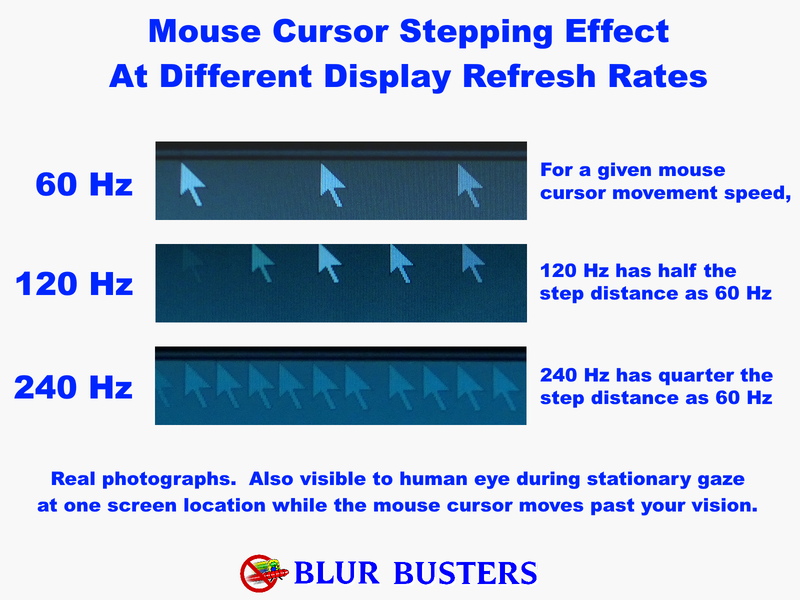 At 480 Hz, the mouse cursor moves massively more fluidly, as does things like window dragging, scrolling, or even staring at the crosshairs while turning/strafing in a first-person shooter such as CS:GO. In all situations, higher refresh rates gives less stroboscopic stepping effects. 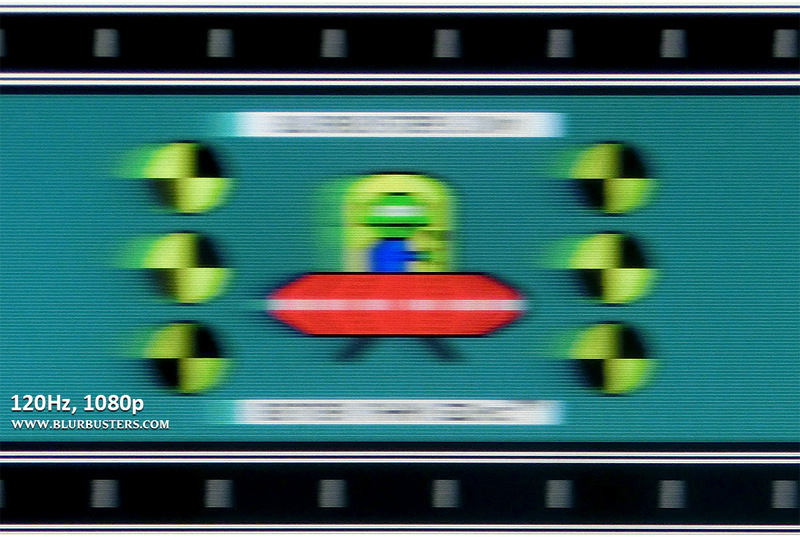 Motion blur from display persistence has long been a problem for LCD panels. Even motion blur also occurs on OLED panels. This effect is well-demonstrated in this TestUFO eye tracking animation. Manufacturers have added motion blur reduction features such as strobe backlights. However, another way to reduce motion blur (without strobing) is simply to add more refresh cycles. 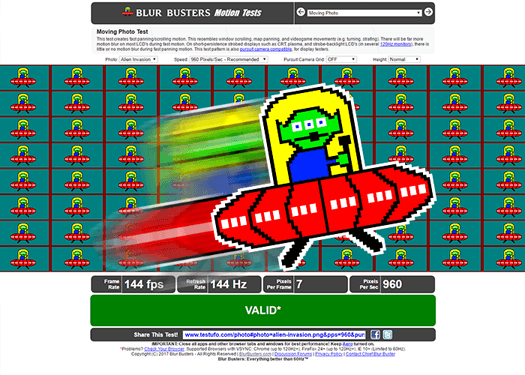 Blur Busters understands the science and physics of display motion blur and its causes. 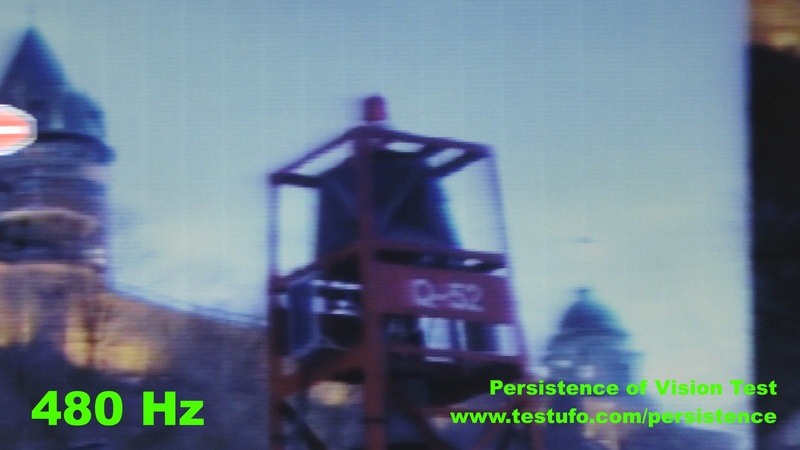 For example, 2ms persistence can be achieved via (1000 / 2) = 500 fps at 500 Hz. This is the same persistence as LightBoost and ULMB which was measured to have a ~2ms persistence. 1ms of persistence (frame visibility time) equals 1 pixel of motion blur during 1000 pixels/second motion. For strobed displays, persistence is the strobe flash length. 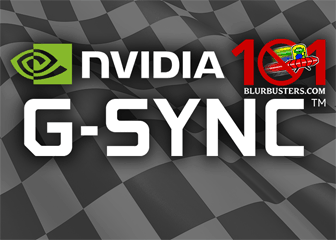 Changing refresh rate does not change the motion blur seen on strobed displays. For CRT displays, persistence is the effective visible phosphor decay time. Changing refresh rate does not change the motion blur seen on a CRT. For sample-and-hold (LCD, OLED) displays, persistence is the refresh cycle length. Doubling the refresh rate can halve motion blur seen on an ideal sample-and-hold display. Instant pixel response (0ms GtG) does not fix motion blur on sample-and-hold displays. Note: Each dummy-circle intentionally has slight color shade differences to test pixel response differences. 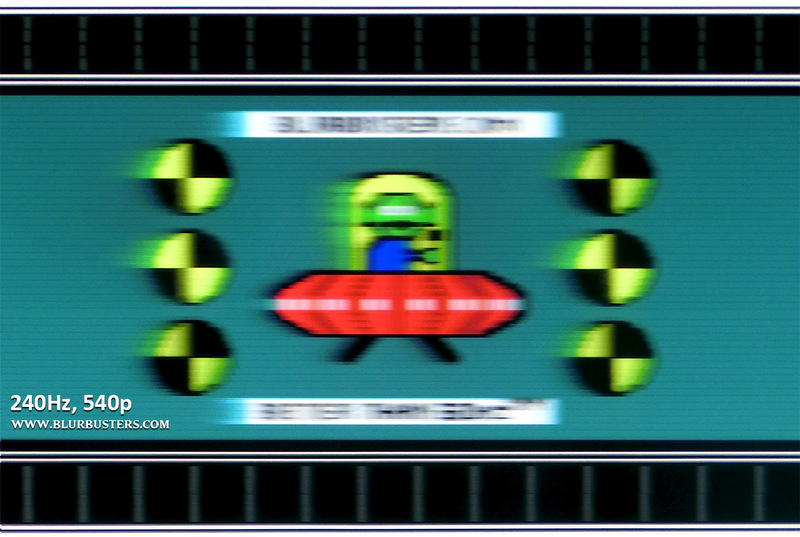 Remember, at 960×540 — these UFOs are moving super fast at 1 screen width per second! This is the LCD motion clarity at that speed, even despite some ghosting from lack of overdrive. 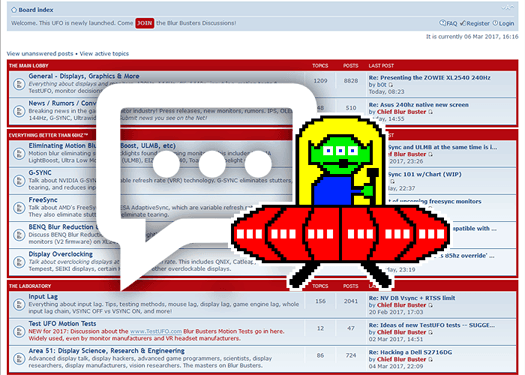 Even the UFO white pixels have red gaps between them during full speed of 960 pixels per second! Fascinating, the human eye can indeed see the difference! These are WYSIWYG photos. Even without overdrive, the difference is noticeable at a movement speed of 960 pixels per second (1 screen width per second). For the first time ever, on an LCD, we see motion clarity almost approaching LIghtBoost without strobing — despite the LCD pixel response limitations (~1ms TN). 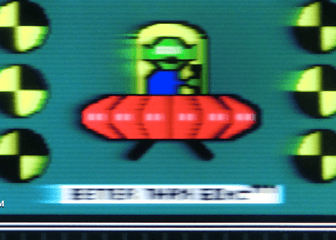 The text “BETTER THAN 60HZ ™” is almost readable without strobing — something that has never happened before in the history of LCD displays without blur reduction modes such as a strobe-backlight. Instead, natural Hertz is used as the means of motion blur reduction here. This is also explained at Blur Busters Law: The Amazing Journey to Future 1000Hz Displays. Alas, 540p makes this only a bonus mode — a bonus addition to 4K 120Hz. But it shows the tantalizing potential of 480Hz (with OLED or good overdrive) of the future displays of 2020s and 2030s at high-definition. Real life does not strobe, and real life motion is analog with no frame rate. Strobing (MBR) is a very good band-aid when we cannot achieve ultra high frame rates at ultra high Hertz. But it is never going to be as artifact-free as real life. The difference is even bigger for 120 Hz versus 240 Hz, even though this display has no overdrive. Lack of overdrive slows down LCD pixel response, so it is still impressive the difference is very visible in TestUFO tests. We do notice that the low-resolution does somewhat temper the advantages of 480 Hz. In addition, an ultra-powerful GPU is required for ultra-high frame rates, and older game engines are needed such as CS:GO or Quake. It is necessary to sustain more than 480 frames per second to maintain the “strobefree near-CRT clarity”, without needing a strobe backlight. In the future, higher resolutions (e.g. theoretical 1080p480Hz and 4K480Hz in our kid’s generation — to achieve the strobe-less holy grail of refresh rates, possibly 1080p 1000Hz within a decade with the help of frame rate amplifiers (geometry-aware interpolators / reprojection / timewarping). Higher resolutions means more motion blur over more pixels, so the difference will be much more visible on higher-resolution ultra-high-Hz displays. You play an FPS game, and try to peek through the crack of a door. Or you’re trying to shoot an enemy through a dense bush. Or you’re driving a vehicle down a picket fence. In the real world, you often tilt your head to “scan” the scenery through a door crack. These effects becomes better at higher Hz. 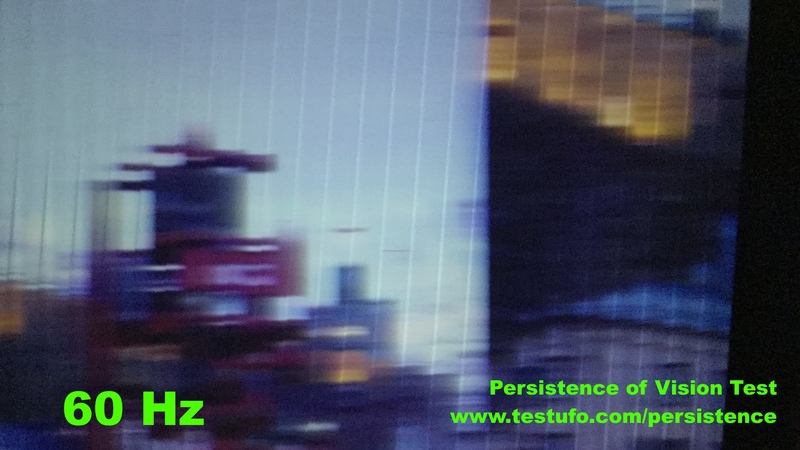 We designed a new TestUFO Persistence Of Vision test. Go see this now, the optical illusion is amazing. We believe it’s the first time in the world that this effect was done fully accurately in a web browser. This is the same principle as a LED spinning bike wheel or Nipkow wheel (1920s) mechanical television set, or a common persistence-of-vision LED clock. Now in a TestUFO motion test. There are practical real world applications for this in future video gaming. Newer games are rendering detailed forest scenery (e.g. Crysis and newer). Shooting enemies through dense bush (while moving) is easier at higher refresh rates. Better ability to “scan” scenery through a tiny 1-pixel-wide door crack. 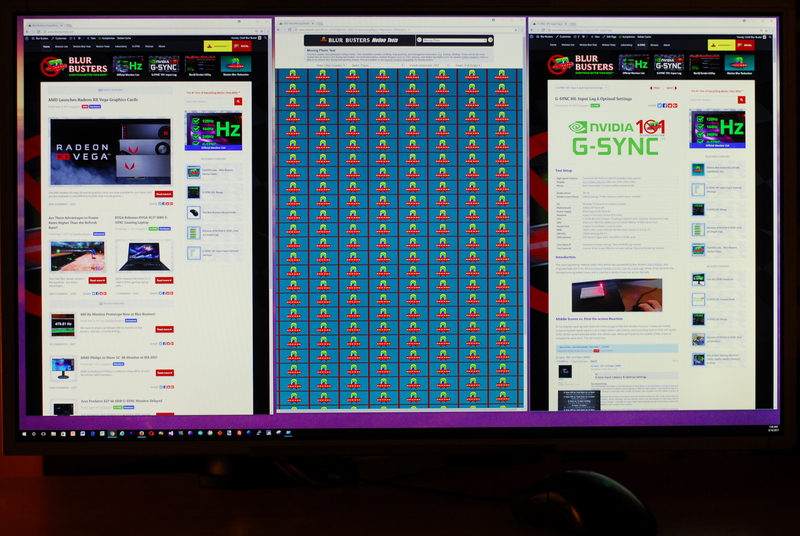 It is much easier to do this with ultra-high-refresh rates. Other scenarios such as driving past picket fences with tiny cracks between wood slats. Obvious gaming use cases can be games in dense jungles where high-Hz will help simulations become more realistic to real-world effects. This will be increasingly important for VR. Understandably, GPU limitations will be an issue in generating high detail at high frame rates, at high resolutions, so we have a long path of progress ahead of us! Open Source Strobe Backlight Firmware! 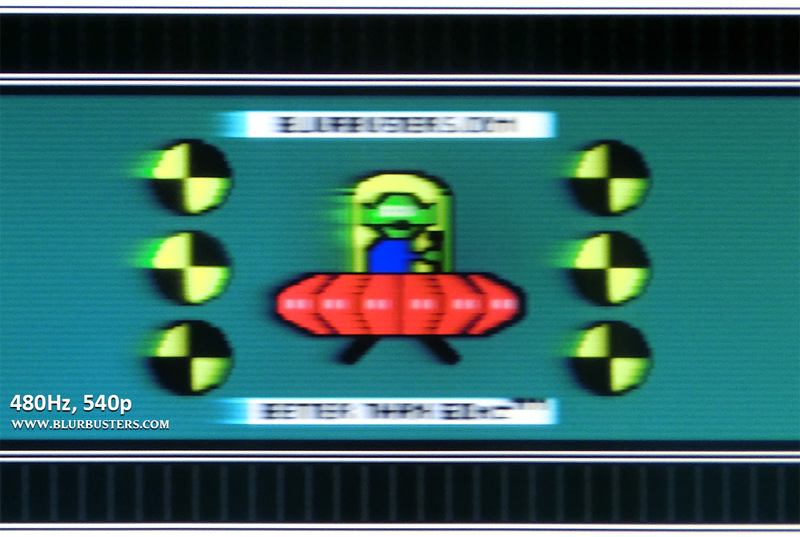 Readers know that Blur Busters extensively cover motion blur reduction backlights. This is achieved via a synchronized strobe backlight to achieve CRT motion clarity without needing ultra-high refresh rates (albiet it does not fix flicker, phantom array effects, and lower-resolution persistence-of-vision effects). Overvoltage boost for brighter strobing at shorter pulse lengths. Strobe backlight “overclocking”! Switchable between strobe mode and scanning backlight mode. Large Vertical Total Support. Huge blanking intervals reduce strobe crosstalk. Zisworks has given Blur Busters the source code to the Zisworks 4K120Hz monitor’s strobe backlight, and it is eventually expected to be released to the public by Zisworks as well. This will permit the ability to easily publish a strobe calibration utility for this programmable backlight controller. 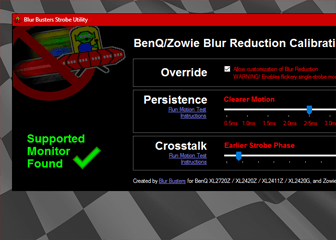 Note: We currently have Strobe Utility for BenQ/Zowie monitors (including 240Hz). The Zisworks engineering sample uses an ultra-fast FPGA chip to achieve the ultra-high-Hz goodness. It works on an off-the-shelf 4K 120Hz LCD, by replacing the LCD panel’s motherboard. Zisworks also has DIY engineering modification kits for those with compatible LCD panels. 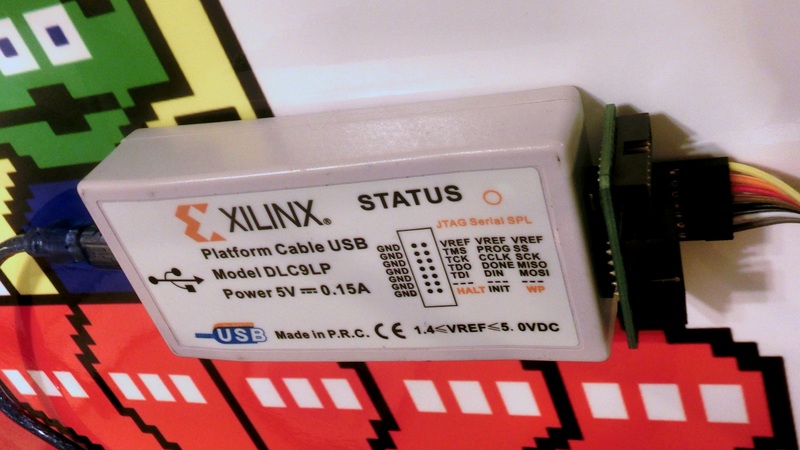 The monitor’s FPGA-driven TCON (the “brains” of 480Hz) is firmware upgradeable with an Xilinx DLC9LP device using a freely downloadable copy of Xilinx Vivado. The kit is also available for a 39″ VA LCD panel to achieve full-resolution 4K 120Hz while also unlocking the same low-resolution 480 Hz mode. However, we recommend, for best motion blur performance, to use the 28″ TN for better pixel response needed for 480 Hz. If you only need 4K 120Hz, both TN or VA are fine. Note: TN LCDs have faster pixel response than VA LCDs. At a certain point, GtG pixel response becomes the motion blur limiting factor, so it is important that pixel response stays far ahead of refresh rate cycle times. The 240Hz versus 480Hz will be much more visible difference on TN than on VA.
Caveat: As an engineer’s product: The image quality of 480 Hz will be degraded relative to 4K 120 Hz. It uses point sampling scaling, and does not have overdrive. 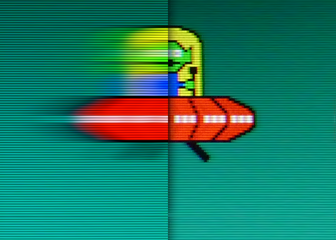 Scanline effects and artifacts are very visible. However, 4K 120 Hz makes this a very handy everyday monitor before 2018 even if the bonus 480 Hz mode did not exist. If you buy this kit, I recommend buying the preassembled bundle. Zisworks (A display engineer) has engineering samples available for preorder at www.zisworks.com/shop with the biggest surprise: The price is still only three digits for the preassembled bundle! 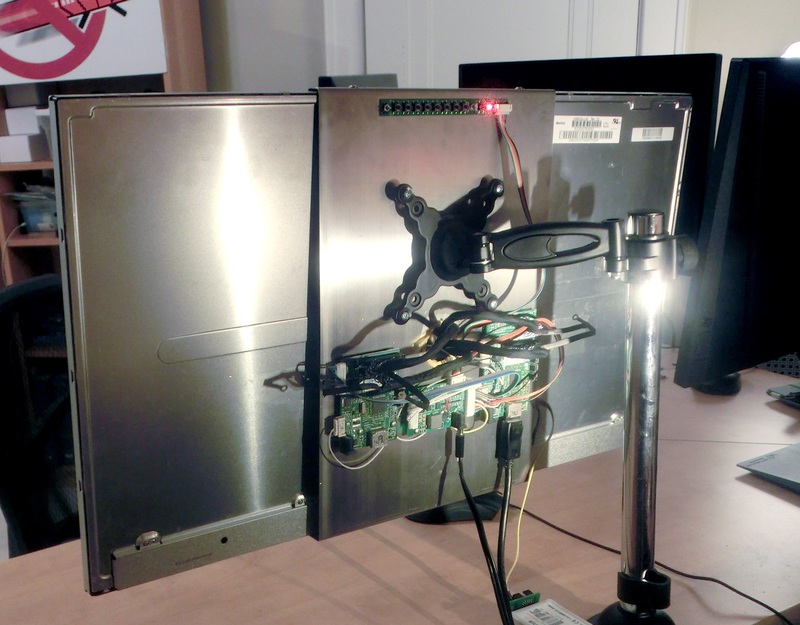 He was the first person in the world to publicly sell a 240 Hz LCD modification kit (in year 2013) and some of our forum members purchased these early 240 Hz LCD kits. We received the barebones kit format. While not for the faint of heart, and its rear is very industrial looking — Zis is a display engineer first and foremost, and an FPGA programming wizard — not a monitor manufacturer (yet?). He sometimes works with monitor manufacturers to help them make computer monitors, and does display engineering consulting services at ZisWorks. if you need a 4K 120Hz display before 2018, Zis is currently the only game in town. There are still eSports tournaments still playing old games such as Quake, and some players use lower resolutions at ultra-high frame rates to get the best advantage. For certain players, 540p may be less of a disadvantage than having potentially the world’s lowest lag monitor. 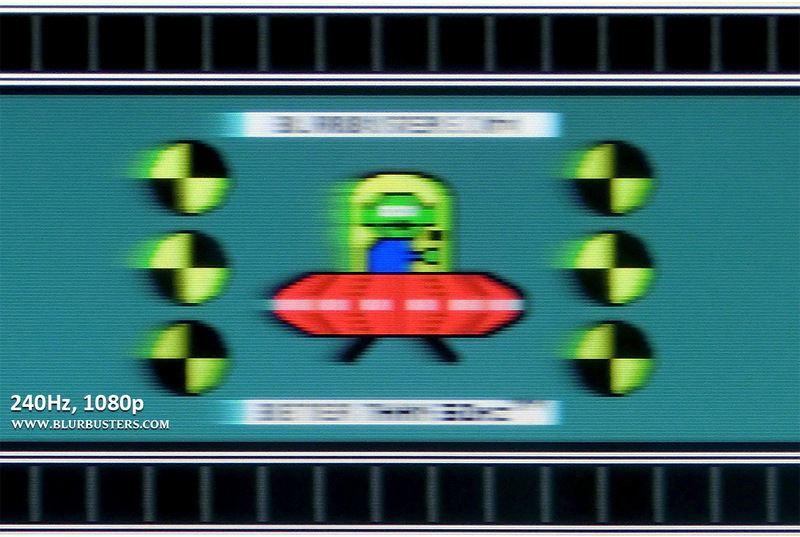 If you are anxious to read more about the future of 2020s and 2030s, check out this new article: Blur Busters Law: The Amazing Journey to Future 1000Hz Displays. Lag Testing of 480Hz is under way. Please follow Blur Busters on both Twitter and Facebook, to watch for Part 2. Is the 39″ panel the same one that was used in the 39″ 4K Seiki TVs? The panel referenced (V390DK1-LS1) seems to have been released around the same time frame. With this many hz you probably could show 3d images (with 240hz for left and 240hz of right eye, one eye view afrer another) without seeing that there are actually two frames. Could you test that for science? I am reeealy curious of the results, this could be a kind of revolution. Glad to test this for you. 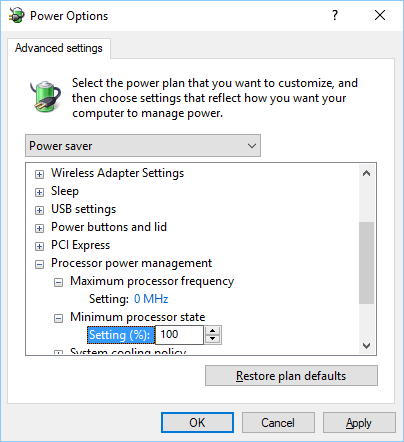 It wouldn’t be possible to get 1080p 480Hz with two Displayports like with 4K 120Hz? Zis has the better details, but I believe it is a different limitation within the LCD, in terms of number of channels available to control the LCDs. At 480Hz, the display can only spend so much time sending voltage to pixels. LCDs are scanned, so each pixel only gets a brief pulse (once per refresh cycle) to begin the pixel transition. So the fewer the pixels, the more time to send voltage to an LCD pixel to get it to move. I understand that the resolution at 480 Hz is 1/4th the vertical resolution of 120 Hz, to keep equal time per pixel row to send voltage to (a set of) LCD pixels to initiate pixel transitions. What about 1440p and is the panel IPS or TN? — 4K120 kits (with 540p480Hz) are available for both. — For 480Hz, I recommend TN. VA will ghost a lot more, obscuring 240Hz-vs-480Hz. — For 4K120Hz, either kit will be fine. 1440p is not an ideal mode for this display due to non-evenly-divisible scaling. I’ve updated my article to include TN/VA mentions. Thanks!